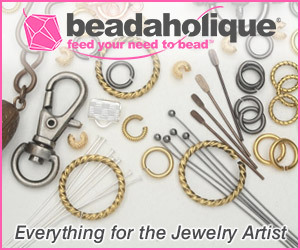 Many of you may already be familiar with Art Bead Scene -a blog celebrating the beauty of uniquely designed beads and written by several artisans. 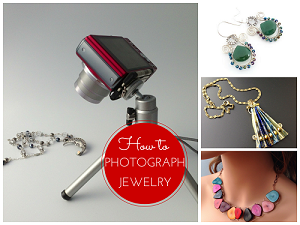 The founder and editor of that active blog is Heather Powers of Humble Beads. 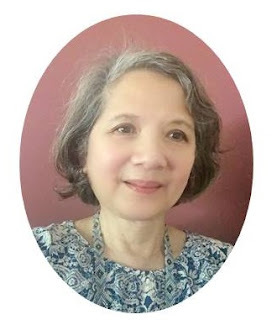 She is not only a polymer clay bead artist but illustrates and writes as well. 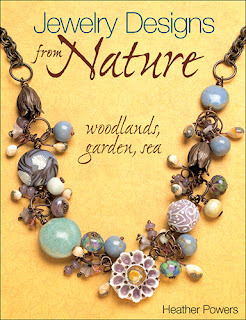 Kalmbach Publishing just sent me her new book Jewelry Designs from Nature for review and it is a celebration of exactly what Heather and her pals over at Art Bead Scene excel at - the making of unique beads. 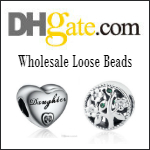 The emphasis of the book is however on the use of selected art beads in jewelry designs. 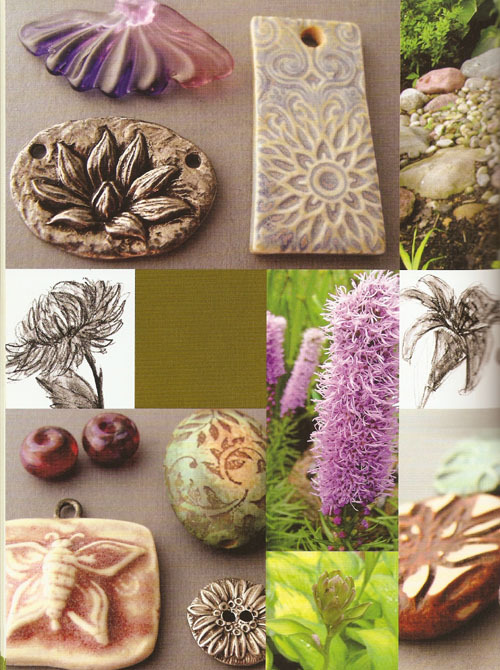 Many inspirational tips are given which help guide other designers on how to use, as Heather puts it, the "supporting cast" - other beads to compliment the art beads. 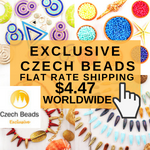 Placement ideas and combination tips all play a role in showcasing the art beads while still paying homage to Mother Nature's original creations. The book is divided into 3 main sections - woodlands, gardens and the sea. 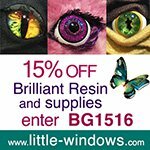 The art bead designers are not only observant but they are able to translate what they clearly love about the natural world into their work. Shown below is a lovely montage from the Gardens section. It's clear that they are inspired by the shapes, colors and patterns they see. 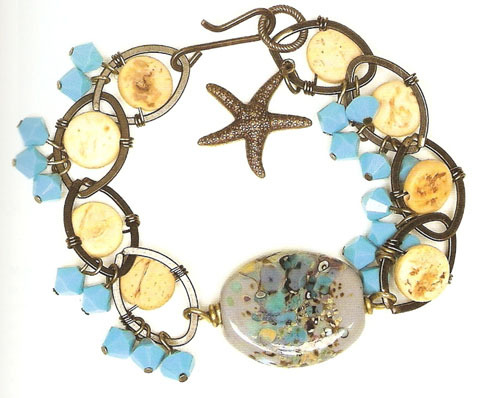 One of my favorite designs from the book is the variation for the Tide Pool Treasures bracelet. The starting point was the tide pool inspired lampwork bead by Blue Seraphim. All the elements stayed true to the theme - the blue bicones representing the water, the sandy discs are the rocks and even the oval links suggest the pools one sees when the tide recedes. The starfish charm was the perfect finishing touch. 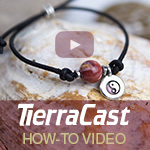 As with all the 32 projects in the book, the techniques needed to create the above bracelet can be carried out by the average beginner who knows the basics and is comfortable with simple wire wrapping. The book is all about inspiration, less so techniques. Anyone struggling with color combinations or trying to find design elements can learn by its example that wonderful ideas can come about simply by leaving your house! It's a pity the words Art Beads did not feature in the cover because they were truly the stars in this book. This book is on my wish list and I can't wait to get a copy in my hands! Great review, enjoy your day! Nature has always been an inspiration for humanity, the first adornments were little more than a sea shell whose naturally formed hole made it ideal to string onto a piece of sinew or plant fiber cording. Perhaps nature's inspiration in jewelry and clothing is one reason we regard her as Mother Nature. The Art Beads in this book are to die for, absolutely fantastic. The photos in it almost make it worthy as a coffee table display book but the information contained within make for too valuable a resource to consign to the top of one's coffee table. Well, the earliest known beads (some 80,000 years ago) were indeed shells which people perforated for stringing. Simple but elegant even for today! Just a foot-note (no I'm not going to say 12 inches equal one foot). Yes, it's like watching a car's odometer turn over only this is better!